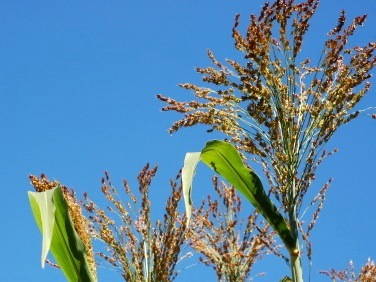 What were you thinking when you planted a lush-growing sorghum plant on your Alabama plantation in 1843? Little did you realize your innovation would spread throughout the nation, forever attaching your name to one of the most noxious and hideous weeds. Farmers and gardeners curse you when this weed infests a vegetable plot, row crop, vineyard, or orchard: "Damned Johnson grass!" You thought the seeds from either Africa or the Middle East would grow to become feed for your cattle, the perfect ground cover for your lands, a high-producing and desirable perennial grass. How could you have known that the normally palatable forage becomes poisonous to livestock if its normal growth is interrupted by drought or frost? You couldn't measure the toxic accumulation of hydrocyanic acid in the surviving roots. You had the image of a nice patch of tall grass gracefully growing and swaying in the wind. Hadn't you heard that Governor Means of South Carolina had already experimented with this monster a decade earlier? He had written, "The big grass inspired terror and no one will look at my place." He could not sell his plantation infected with this weed. I thought all you plantation owners ran in the same circles. But no, you were then called "Colonel Johnson" and, with a Southerner's arrogance, you probably thought you could do as you pleased with your property. So you sowed the fertile bottomlands of the Alabama River and became part of history. With the Civil War, cavalry horses simply ate the lush grasses and spread the seeds throughout the south. Then later, in the late 1800s, your seeds could easily contaminate a nation as members of Congress passed out hundreds of thousands of free seed samples annually or when the United States Department of Agriculture distributed more than one million seed samples per year. Was this your revenge for losing the war? A single plant can produce over 5,000 seeds and lie dormant in the ground for 20 years. Chop the stalks and new shoots push up from the earth with more vigor. Burn the plant and it seems to thrive on cleansing, easily outcompeting anything else with regrowth. The plant's secret weapon: the underground stems called rhizomes. From each segment of root, new shoots rise like a head of the Greek mythic Hydra. Cut off the head and two will appear. Slice the rhizomes into small pieces and each will regenerate its own plant. Disking and cultivating the ground spreads them even more, the plant delightedly invading any disturbed ground. The plant grows dense, up to eight feet tall, easily monopolizing sunlight and crowding out any other growth. Try to shovel the roots and your blade will strike a contorted root mass of thick rhizomes often tangled in a massive underground ball. Miss some roots and they will start producing a natural toxin, preventing other plants from growing close to them. Your grass, Mister Johnson, does not make for a good neighbor. How foolish you and others were, thinking you could control the forces of nature, import something for your own use, believing only good would come from the innocent-looking reddish seeds. Your goal, of course, was simply to produce more and more — stories of this grass generating over two tons of forage with each cutting danced in your head. This was America, land of new opportunities with unbound fortunes for those with an enterprising will. Instead, you cursed a nation. Some have claimed your grass is not that bad, were it not so aggressive. Swine apparently relish the roots, which can be quite palatable. Cut for hay, it becomes nutritious (so long as the plant is not stressed into producing natural toxins). Some seed dealers actually sell the seeds. I certainly would not call them my friends. While yanking out your grass from my vineyard, many times I have slit my fingers. The razor-sharp leaves slice unprotected hands. My grandmother called your weed abunai kusa (dangerous grass). She was correct; unchecked, it will strangle a farm and the farmer, stealing water from trees, shading grapes from the sun, overpowering a vineyard, and striking terror in a harvest worker. An invasive weed — that's an understatement. I've woken up in the middle of my sleep from a nightmare of Johnson grass sweeping across our Valley, marching like an army, destroying acres and acres of land. In my dream I see men and women waging war, cutting down stalks, never allowing green growth to survive. But the roots lie quiet in the earth, waiting for exhaustion and resprouting with vengeance. Your legacy has bankrupted scores of farmers. I've heard stories of range wars, neighbor pitted against neighbor, your seeds of destruction carried in the bowels of cattle. One story ended with a bitter divorce; a son-in-law could never understand why his father-in-law hated him. Apparently, someone had to be blamed when your grass became established on his ranch. I do have a conspiracy theory: the Johnson family had a patent on the French plow, a complicated piece of equipment that will reach under a grapevine and scoop out a mass of earth and, hopefully, Johnson grass plants and most of their roots. The tool does well, but is not perfect against this perfect enemy. Or perhaps your family had envisioned future shares in Monsanto, the company that invented Roundup. The herbicide is absorbed into the plant and will kill most of it. With heavy infestations, you have to reapply the chemical to kill all the rhizomes. Mister Johnson, you have taught me one lesson. I am humbled. Your grass, an alien species, invaded our nation and planted roots. A plague? No, that would imply a cure. A curse. Yes, something we must learn to live with. I will accept Johnson's curse but will continue to engage in battle on my organic farm. You have left your imprint and I do often speak your name, accompanied occasionally by profanity.